Two core characters (with more planned!) that each have their own unique set of cards. 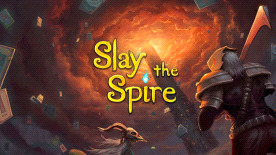 Slay the Spire is a unique blend of punishing roguelike games like Spelunky and card games like Hearthstone. In it, you must climb the Spire, fighting enemies and building up your deck as you make your way to the top, each time making a little more progress as your skills improve and your arsenal grows. You will take part in over 50 unique monster encounters, using a range of over 200 cards across two distinct characters. Each of the characters come with their own strengths, weaknesses, and, of course, cards. Levels in Slay the Spire are procedurally generated, ensuring that you will have a different experience every time you attempt to reach the peak. To master this complex game, you must learn your deck. Figure out which cards compliment each other, find the weaknesses of the Spire’s monsters and take advantage of the kink in their armour. As you make your way to the top you can choose from the slow and safer route, or you can take risks and get to the peak more quickly. Every decision you make could be your last. Of course, there is more to your decisions than ‘fast or slow’, ‘difficult or easy’. There are items hidden throughout the Spire that allow you to enhance your deck. These Relics can really impact your power so you will covet them more than the peak of this towering den of beasts. The monsters you face in Slay the Spire are not your usual RPG affair, either. Sure, you will fight giant rats, but the rats are already dead and they are actually being controlled by some hellish parasite that bursts through its flesh and drives the creature into battle. To face these monsters down, you will need your wits. Oh, and the right cards. Bolster your block, boost your attack, and fire out deadly spells. Call on blood magic to damage your enemy at the cost of your own health. Conjure up a barrier of flame that licks at any enemy who dares to attack you. Purge cards from your deck with a visit to the merchant and replace it with something that suits your character more. Earn gold as you progress and gain the ability to min/max where you want. If you are looking for something to completely lose yourself in Slay the Spire is packed with compelling content and you will find it hard to tear yourself away. The great thing about Slay the Spire is how a single run can be brief. You can play it in short bursts, you never feel like you are losing massive amounts of progress. Instead, you always feel like you are growing and learning for the next run. It gets to the point where you just want to have one more run. Then another. The one more before bed. Before you know it, it is morning and you are regretting all your life choices. It won’t be long before you find yourself at work, wishing the hours away so you can get home and build that perfect deck.